DEMBA Ba has turned down Newcastle United’s latest contract offer, The Journal can reveal. 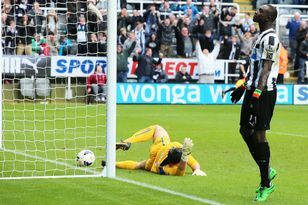 The Senegal striker’s advisers have been involved in negotiations with the Newcastle board for several months but have been unable to come to an agreement, with Ba’s wage demands currently the stumbling block. That led to the latest offer – believed to have been tabled more than a fortnight ago and involving a significant pay bump for the striker – being turned down by the Newcastle forward’s representatives. That raises the possibility of Ba (pictured left) activating his £7.5million release clause in January, although the indications are that the player himself would prefer to stay on Tyneside, where the coaching staff are desperate to see the influential forward remain. There are no indications that Newcastle are ready to withdraw their offer and instead are taking a similar approach to the one that eventually found an agreement with captain Fabricio Coloccini after painstaking negotiations last year. But the forward’s representatives will have to lower their wage demands to push through a deal. Ba’s advisers want an agreement in excess of £80,000 a week, which would make him one of the club’s top earners. But Newcastle will not go to that and have compiled a list of back-up options if he does leave. The problem for the striker is that, while £7.5million does represent a good deal for interested clubs, there are additional costs and fees which mean that the deal is worth much more than just activating the release clause. His record is bound to prompt interest from home and abroad. A potential move to Turkey last season did not materialise but Liverpool have scouted the striker over the past few months, while Harry Redknapp was interested in the player when he was Tottenham manager. Quite whether Ba is prepared to swap Newcastle for another club in January is another matter entirely. Reports yesterday claimed a rift between the striker and Senegalese compatriot Papiss Cissé, but sources at St James’ Park have painted Ba as a model professional and the ongoing negotiations have had little effect on his form, which has see him hit eight goals so far this campaign. Boss Alan Pardew will not want to lose Ba but is realistic enough to know that his departure is a possibility. He admitted back in September – unprompted – that a release clause was still in the striker’s contract and that Newcastle are “vulnerable” to predatory clubs. “There is that clause in his contract and it makes us vulnerable. It’s still open in the next window,” he had said. In the meantime, the first priority for Pardew is to arrest a four-match losing run that has left the board expressing “concern” at the team’s precarious position. Wigan are tough opponents and despite a much-improved performance against Stoke there are unique demands on the team as they face the Latics tonight. The Magpies have the chance to avenge last season’s FA Cup exit after they were drawn away to Brighton and Hove Albion in yesterday’s third-round draw. Mike Williamson’s own goal gave the Seagulls victory in January’s fourth-round tie. DEMBA Ba has not been carpeted by Newcastle United – but Alan Pardew admits the constant speculation surrounding the striker must be “annoying” for his team-mates.